After a long period of failure in development, two new medications (phentermine/topiramate ER – Qsymia™ and lorcaserin – Belviq®) have been approved by the US Food and Drug Administration for long-term weight management in persons with obesity (BMI ≥ 30 kg/m2) or in overweight persons (BMI ≥ 27 kg/m2) with comorbidities. Another medication, bupropion/naltrexone, is undertaking a cardiovascular outcomes trial and an analysis in 2014 will determine its approval and release. The most widely prescribed drug for obesity, phentermine, used since 1959 for short-term weight management, has been released in a new formulation. 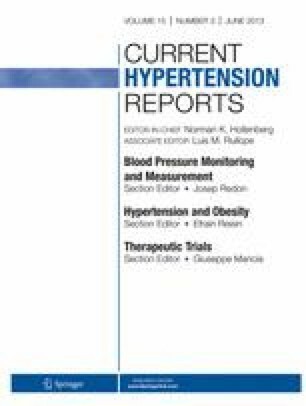 This paper reviews these new medications, and other important events in the landscape for management of obesity, with an eye to the interests of physicians who manage hypertension. All the new drugs under discussion are re-fittings of old agents or fresh approaches to old targets; thus, what is old is new again in the pharmacotherapy of obesity. D.H. Ryan has received research funding from Arena, Vivus, and Orexigen; consulting fees from Arena, Vivus, Esai, and Scientific Intake; travel support from Arena, Vivus, and Esai; payment for serving as a board member from Novo Nordisk, Scientific Intake, and Alere Wellbeing; and stock options from Scientific Intake. G.A. Bray has received research funding from National Institutes of Health; consulting fees from Takeda Global Development; payment for lectures including service on speakers bureaus from Medifast and Global Direction in Medicine; and royalties from CRC Press. Decision Memo for Intensive Behavioral Therapy for Obesity (CAG-00423 N). http://www.cms.gov/medicare-coverage-database/details/nca-decision-memo.aspx?&NcaName=Intensive%20Behavioral%20Therapy%20for%20Obesity&bc=ACAAAAAAIAAA&NCAId=253. FDA briefing information: meeting of the Endocrinologic and Metabolic Drugs Advisory Committee. 2012. (http://www.fda.gov/downloads/AdvisoryCommittees/CommitteesMeetingMaterials/Drugs/EndocrinologicandMetabolicDrugsAdvisoryCommittee/UCM292315.pdf). FDA briefing information: meeting of the Endocrinologic and Metabolic Drugs Advisory Committee. 2012. (http://www.fda.gov/downloads/AdvisoryCommittees/CommitteesMeetingMaterials/Drugs/EndocrinologicandMetabolicDrugsAdvisoryCommittee/UCM303198.pdf). • O’Neil PM, Smith SR, Weissman NJ, Fidler MC, Sanchez M, Zhang J, Raether B, Anderson CM, Shanahan WR. Randomized placebo-controlled clinical trial of lorcaserin for weight loss in type 2 diabetes mellitus: the BLOOM-DM study. Obesity (Silver Spring). 2012;20(7):1426–36. doi: 10.1038/oby.2012.66. Epub 2012 Mar 16. This randomized clinical trial shows that lorcaserin significantly reduced body weight and improved cardiometabolic risk factors in patients with diabetes mellitus. VI-0521 (QNEXA®) Advisory Committee Briefing Document. NDA 022580. Endocrinologic and Metabolic Drugs Advisory Committee Meeting. 2010. http://www.fda.gov/downloads/AdvisoryCommittees/CommitteesMeetingMaterials/Drugs/EndocrinologicandMetabolicDrugsAdvisoryCommittee/UCM292317.pdf. Accessed 15 March 2012.